Today is the 241st annual day in the United States since the final draft of the Declaration of Independence document was approved and put forth. The actual agreement by the Continental Congress to separate from the British, was actually on July 2nd. I had my day off from work, celebrated my independence by staying home for much of it, tending to chores and projects. I did take a short walk outside, to enjoy the nice summer weather; a warm push of mid 70’s Fahrenheit with a gentle breeze throughout. No fireworks for me today. I am safe inside, with my windows shut and my headphones on. I hope for the many patriots out there, to stay safe and enjoy what the day gives you. Today’s picture is the great Space Needle of Seattle, about two hours before sunset. A flag stands above it, to celebrate the 4th of July. 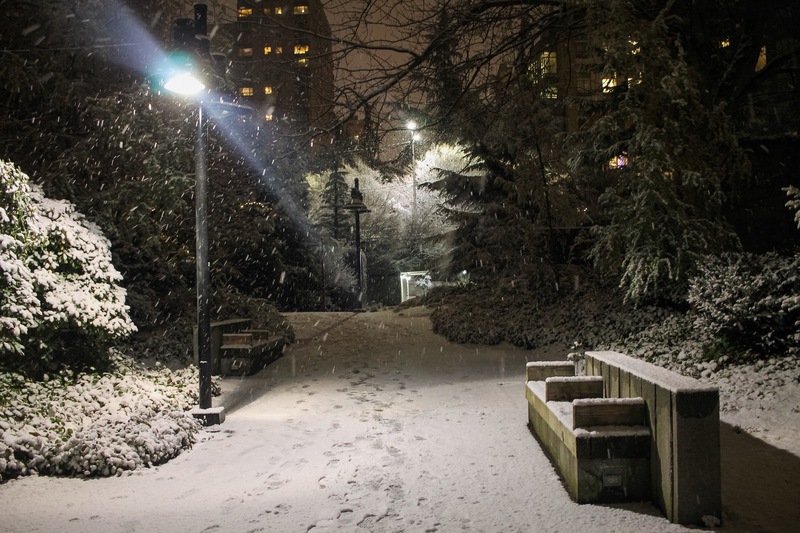 Last Thursday night, much of the Seattle lowlands got about one inch of snow. Such is a rare occurrence for this grand city. For myself, the new sights are very exciting, as I have never lived or ventured out in areas with normal snowfall. Yet, there is much beauty to appreciate in the first hours of the mass landscape transformation. Though I was not feeling well from a recent slip, I did go for a stroll in the wall and take some pictures of the Downtown area. Sorry, I did not get a pic of the great Seattle Space Needle in that time. I underestimated the cold, and my body needed a return to my warm apartment. Perhaps, next time. Picture of the Weekend, early December 2016..
Just a moment among many, where the holiday spirit was shared among the locals. Here, being Friday as some streets in the downtown area were shared for some happening at the nearby Westlake Center. Not quite feeling like a crowd, I enjoyed this jolly group of youngsters jamming with their brass, in a little march of their own. No names, cause, or message. 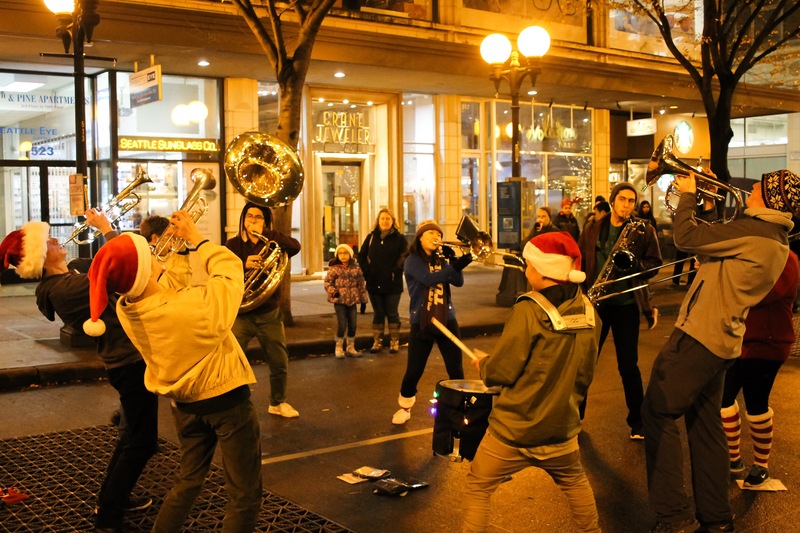 Just a brief spirited jam playing some familiar Xmas tunes in the middle of the holiday lights and shopping madness. That’s enough for me. Weekend Thoughts 11/29/15, A Needed Peace of the Season.. Meanwhile in the Emerald City, the Holiday Season feels fresh once again. Though this could be the same picture as what will happen during the following weeks. To the left is part of a very tall Christmas tree, which was present last year in this very spot, and probably the next. If not for some particular buildings in the backdrop, this deco could be easily mistaken for nearly any developed big city. 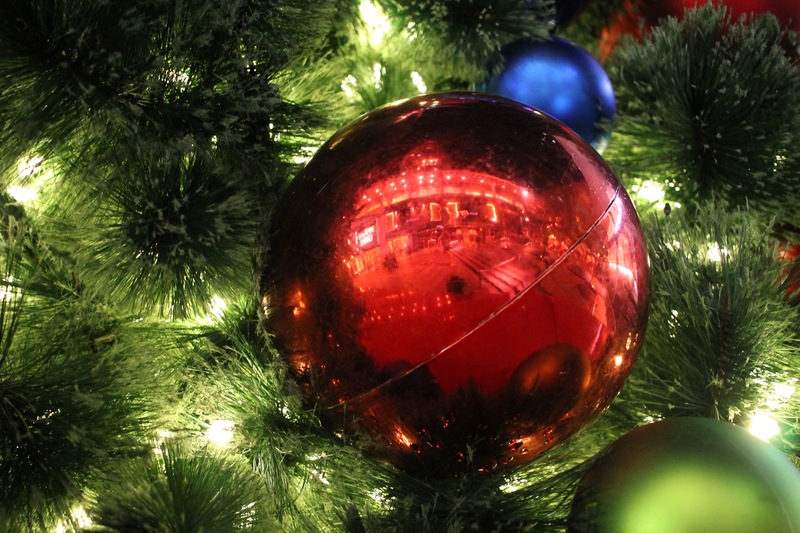 What makes the holiday season special is not the deco, but the people what they make of it. Not everyone may find the holiday symbolization as welcome. 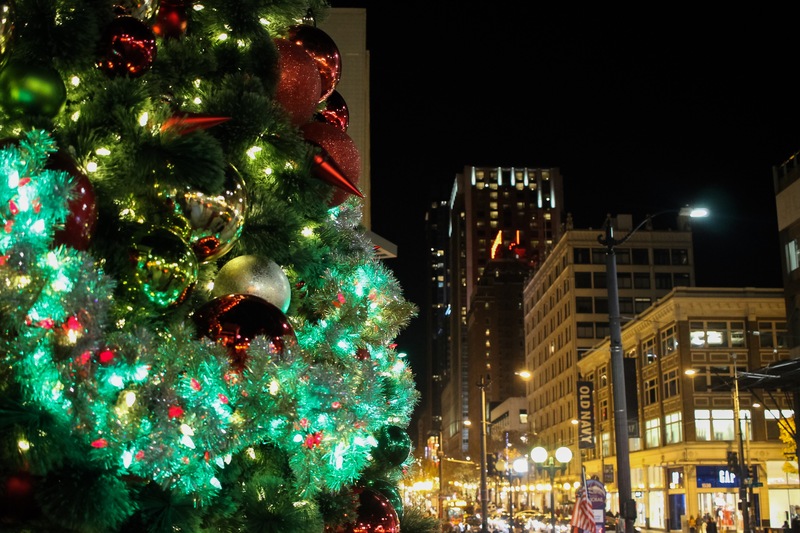 For example, the night before the above picture was Black Friday, a day infamous for shopping madness frenzy on “doorbuster’ deals; and also for tree lighting ceremonies and opening festivities. 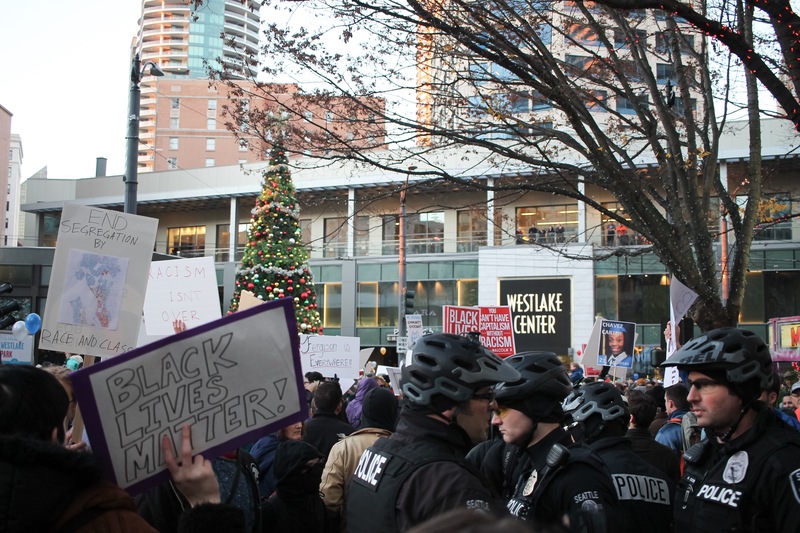 It was (and I think becoming) a day for civil unrest and social justice here in Seattle at least, as a massive Black Lives Matters protest developed in the midst of a crowded Westlake Center area. This was similar to last year’s Friday after Thanksgiving. There are many points of view on whether that was a good or bad outside additive to the holiday festivities, but such a happening brought this particular place and setting a somewhat distinct feel to it all. Here was that tree in the background on that evening.. The crowd was quite massive, with a mix of emotions on the invasive presence of the Black Lives Matters protesters with chants and signs calling for an end to police brutality, racial discrimination, and social injustice. Walking through the crowd I heard approving and disapproving voices (with dashes of racism as well). For me, my claustrophobia was developing, and thought my place was away from all this. Also, I was very hungry..
And that brought me to thinking while I heard the fireworks boom in the distance, that perhaps the Holiday season does need some change. 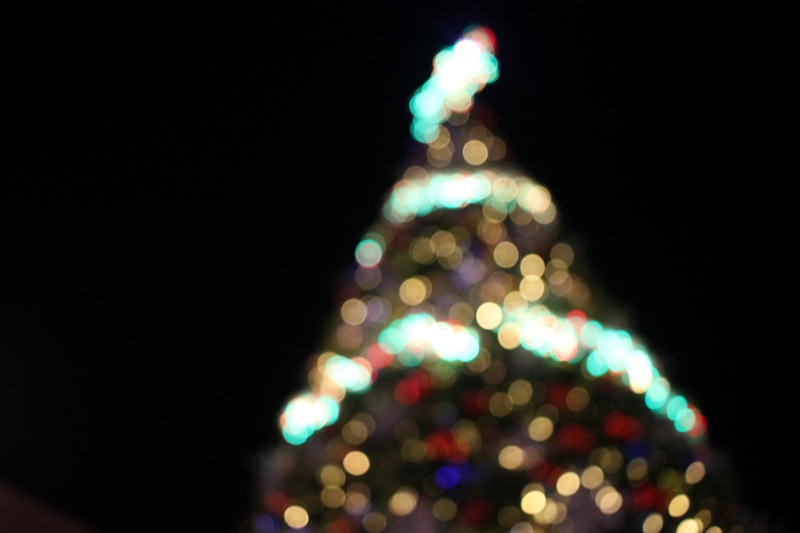 Should some consideration of what is not right in the world, have a damper on holiday festivities, or should we take time out ponder this incompleteness of our Holiday season? 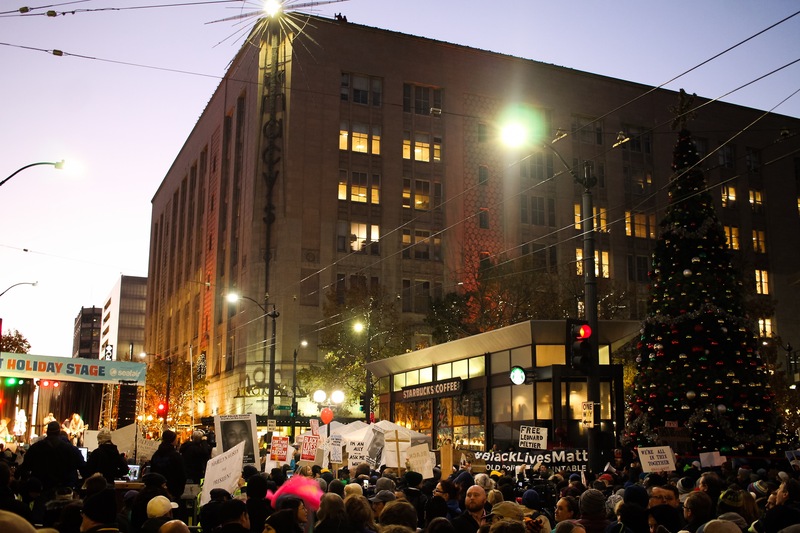 I felt the reason for the BLM protest; a large group of people felt a disconnect with a dominant status quo on the long-running issues of racism and police brutality in the US, and perhaps that was reason enough to interrupt the joys of tree lighting and musical entertainment. Is it reason enough to interrupt the planned joys to the bigger crowd? That’s for the public to decide, if any change will gain support, or result in resistance. But either way, I felt what the Pope said to where we can’t quite celebrate the spirit of Christmas without considering the larger pictures outside our comfort zones (though he was referring more to the escalating war conflicts). War, injustice, starvation, and other signs of inhumanity..still out there. So, I will be thinking of some good deeds I can do, perhaps giving and donating to the homeless and less fortunate (an issue I feel this city of Seattle needs to address more). I will read more on what else troubles humanity this Season, and consider what I can do to make a holiday season festive for those who truly need it more. Meanwhile, we can’t all be magically happy with doorbuster deals and seasonal lights as we start the Holiday Season. I will continue to appreciate any wonderful displays of Christmas decoration, because otherwise the month is too cold. Perhaps, we people should collectively take more time to understand and show some compassion to the distraught toward the time of Christmas Day, even if their messages are not convenient to our liking. That extra warmth and additive in our traditions could go a long way, and make the next Christmas Seasons even more festive.